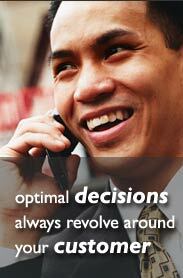 Informed Decisions Group - About Informed Decisions Group, Inc.
About Informed Decisions Group, Inc. The Informed Decisions Group's mission is to provide its clients with optimal decisions in order to better understand and improve business processes, allocate scarce resources, recognize new opportunities, and gain market advantage. Optimal decisions always revolve around the customer, client or patron. Informed decisions are fact based, closed loop, and future focused. "Customer First!" is the IDG motto. We put the "Customer First" philosophy at the heart of our projects, which focus on using data warehousing, data mining, marketing science and market research to continually improve business line management. We combine the talents of market researchers, analysts, programmers and consultants to find intelligent solutions for our clients information needs. Consulting services include customer relationship management, customer knowledge building, information technology strategy, and general statistical analytical services. Our Informed Decisions Seminars have helped hundreds of executives put our three-step process to reducing uncertainty to work for them. Informed Decisions Group will keep client information and records of client engagements confidential and will use proprietary client information only with the client's permission. In all cases, Informed Decisions Group subscribes to the Institute of Management Consultants Code of Ethics stressing ethical conduct along with integrity, competence and objectivity. Leon Schwartz has over thirty years experience in management consulting, marketing, information technology, product development and applied research. Dr. Schwartz led the corporate management science consulting group at Pitney Bowes, Inc. and provided analytical database marketing technology services to Pitney Bowes customers. He directed programs in customer retention, intelligent cross selling, customer segmentation, and targeted marketing; and was responsible for market research, and customer data warehousing. He operated data centers and created decision support systems and strategic information systems. Leon has been leading advocate of the "Customer First!" approach, speaking at conferences and forums and publishing in industry media.